WHIPPANY, NJ--(Marketwire - Sep 11, 2012) - A convenient choice near New York City and Newark Liberty International Airport, the Hanover Marriott offers guests a comfortable stay and great value. And for riders participating in the Bike MS Great New Jersey Country Bike Ride, the property is proud to offer a home base. The staff and management of the Hanover Marriott are proud to sponsor the event, which takes place Saturday, September 22nd and Sunday, September 23, 2012. Each route includes fully stocked rest stops every 10-15 miles, a great lunch stop each day and safety provided by volunteer EMTs, HAM radio operators, the Wayne, New Jersey Police Department and bicycle repair from our partner bike shops. Each day concludes at the Hanover Marriott, where riders will be treated to a delicious meal, massage, musical entertainment and an evening program featuring a comedy show. On Sunday breakfast is provided, and on the road where the route leads riders back to Morristown, NJ for a finish line celebration! Among local hotels, the Hanover Marriott is central to vibrant Morristown and corporate office parks. The Marriott is ideal for New Jersey weekend getaways or business meetings, featuring 353 guest rooms and suites, indoor and outdoor swimming pools, state-of-the-art fitness center and expertly designed meeting rooms. This hotel in Parsippany, NJ features the largest Grand Ballroom among all Morris County hotels and holds up to 1,000 guests. With an abundance of amenities, the Marriott Revive bed and a collection of Parsippany, New Jersey hotel deals, the Parsippany, New Jersey, hotel's accommodations are an ideal choice for a romantic getaway. And when it comes to Irish pubs, New Jersey doesn't have anything else as genuine as the Auld Shebeen, an authentic Irish pub fashioned in Ireland from reclaimed materials and reassembled inside the Hanover Marriott. It all comes together for a uniquely comfortable stay. Just 24 miles from Newark Liberty International Airport, the Hanover Marriott Parsippany, NJ hotel is beautifully situated 40 miles from New York City and surrounded by more than 30 Fortune 500 companies in the Parsippany, Hanover and Whippany areas. This convenient option among hotels near Morristown, NJ features 345 well-appointed rooms and 8 spacious suites on 8 floors. For meeting and event planners, this property offers 22 meeting rooms with a total of 18,850 sq. ft. of total meeting space. 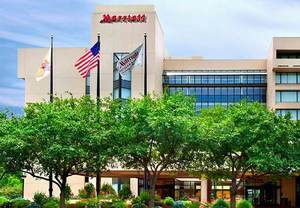 The Marriott is ideal for New Jersey weekend getaways or business meetings, featuring 353 guest rooms and suites, indoor and outdoor swimming pools, state-of-the-art fitness center and expertly designed meeting rooms.